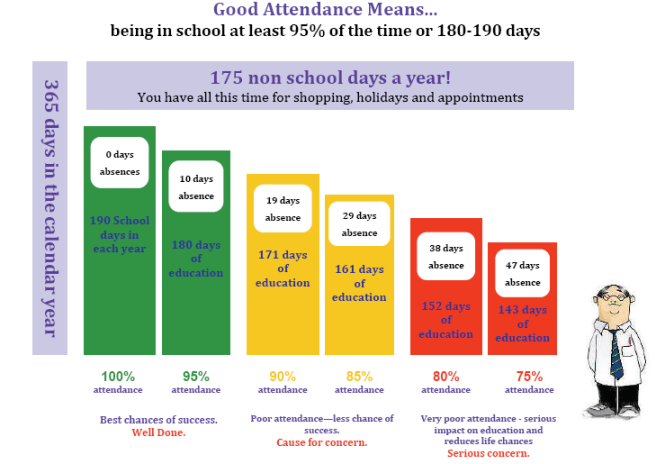 The chart below shows very clearly the damaging effect of missing time at school. At Belmont Primary School we are committed to ensuring that our students have every opportunity to develop character, achieve success and realise their full potential. In order for our students to secure achievement at Belmont, it is vital that they attend every day, are on time and work hard. Routine medical or dental appointments should be arranged for after school or during the holidays. In exceptional circumstances you may need to collect your child during the school day. If this is so, please let us know beforehand. In the interests of safety, children cannot be released from school unless accompanied by an adult. Please use the signing in/out book in the office when you collect/return your child. Whilst we expect all children to attend every day it is inevitable that from time to time certain things will prevent this. If your child is unable to attend school for any reason it is vital that you let the school office know by 9.30 am. If the absence will be long term ie for Chicken Pox or recovery from an operation please advise how many days your child will be absent. As well as being a key piece of safeguarding practice it also ensures effective communication between home and school which is critical in supporting the return of children to school after absence. Attendance drops below 93% and includes periods of unauthorised absence – Attendance Concern letter is sent. Attendance does not improve within an agreed time period following Attendance Concern letter – Attendance Panel Meeting letter is sent. These letters can often alarm some parents due to the legal content that we make reference to. Whilst we do not wish to cause any alarm to our parents and families it is vitally important that you are fully aware of legislation relating to our attendance policy and we will always endeavour to support you and your child within this process, our intentions are only ever to improve children’s success at school. As of September 2018 all holidays taken during term time will be referred to the local authority to be screened for the issuing of a penalty notice. Exceptions to this change are where a holiday has to be taken during term time due to significant work commitments, for example, service men/women who are not permitted to take leave during certain times of the year, or for any holidays which have been booked prior to 19 July 2018; evidence will be required in order to confirm this. Absence due to your child's birthday is not a valid reason an absence and will be recorded as unauthorised. If your child is late without a legitimate reason and it becomes persistent then a meeting will be arranged for parents and the potential for penalty notice discussed. If you would like to discuss your child's attendance please feel free to call the school office to make an appointment where one of the attendance team will happily arrange to meet you. Children in Year 6 take Standard Assessment Tasks (SATs) in the Summer Term. Requests for leave of absence will not be authorised during this period for Year 6 pupils. In Year 1, pupils have a phonics screening check in June – again, leave of absence cannot be authorised at this time. Attendance - Lateness, What's The Big Deal?